I never would have guessed when taking French in high school that I would end up marrying a Frenchman and working part-time in France one day. Each year, I offer small group tours on the “inside” track highlighting food and local French people. 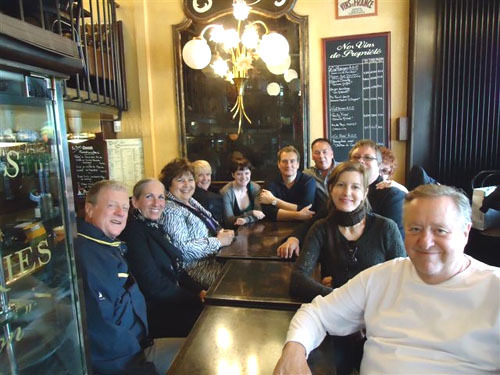 I have been leading people on tours in France since 2006. Due to demand from repeat clients, I have since expanded to Greece and Italy. Small groups of 8-10 people: With me as your travel companion, we travel as a small group of friends. We travel on our own, and all activities are arranged privately for our group; we do not hook up with larger tour groups at any point. On the “inside” track: We travel as locals to enhance our experience of the culture. In Paris, travelers have their own Parisian apartment, and in the Provinces we stay in small villas or boutique hotels, providing a familial environment. Whichever tour you choose, you’ll get a more interesting and memorable trip than one offering a stay in generic hotel chains. An emphasis on food: Being a culinary instructor, you can’t escape good food when you travel with me. Some itineraries include hands-on cooking events; but all of my trips emphasize authentic, top-quality cuisine. Every region of France has its own specialties waiting to be discovered, and it is my job to introduce them to you! Connecting with locals: Part of the charm of a country comes from its people. With every itinerary, I weave in activities with local French people, be they tradespeople, chefs, friends or family, in order to provide a richer, more meaningful trip available exclusively to you. Comfort vs. Luxury: I classify my tours as 3-star (versus a 5-star luxury tour). Unlike in Paris, where many buildings have been retrofitted to accommodate an elevator, traveling to the Provinces is synonymous with climbing stairs. Comfort, however, is never sacrificed; nor is beauty and taste. Emphasis on GREEN: We visit with local producers, enjoy in-season delights, and recycle much of our waste (Paris only), as nearly all apartment buildings offer convenient sorting facilities.